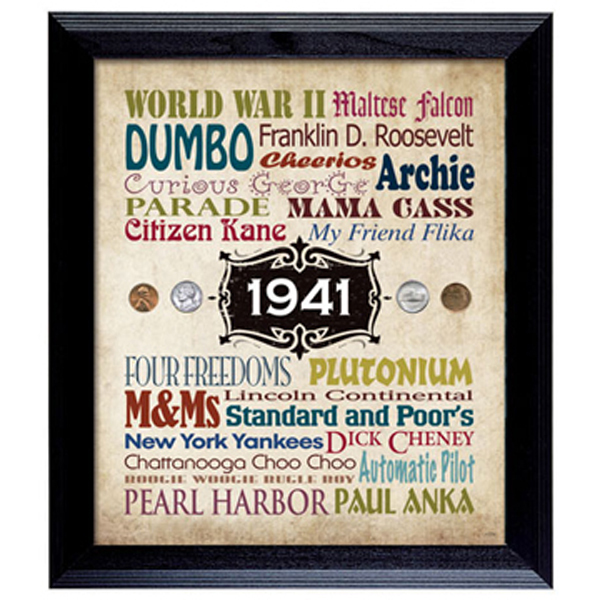 Celebrate a birthday, anniversary or graduation with A Year In Time Celebration Wall Frame. American history shares a canvas with two genuine U.S. pennies and two nickels from the same year. Enjoy fun facts and memories of American culture nestled in a black wood 14" x 16" inch frame. Sports, politics, news events, technology and retail facts are typeset in a pop fashion full of color surrounding genuine coins displaying the year of your choice (only available in the years 1934-2014, nothing before that). A Certificate of Authenticity is included. Allow 2-3 weeks for delivery. Item can only be shipped within the Continental US.